October 21 is International Day of the Nacho that is celebrated annually in the USA and Mexico. This popular snack has a Mexican origin, but it's loved all over the world. Nachos appeared in Pierdras Negras, Mexico, in 1943. The story says that several army soldiers wives went shopping. But when they finally stopped for dinner, all restaurants were closed. Ignacio “Nacho” Anaya, the restaurateur of El Moderno, didn't want the ladies to leave hungry that's why he cooked something special for them. He sliced tortillas into triangles and covered them with shredded cheddar, then put them into the oven. Then he added some sliced jalapenos and served it to the ladies and called the snack “Nacho's especiales”. Later the dish was shortened to “special nachos” and plain “nachos”. Ignacio Anaya died at the age of 81 in 1975. A bronze plaque was erected in his honor in Piedras Negras. And October 21 was declared as International Day of the Nacho. 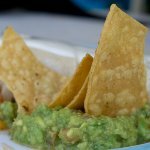 Annual nacho competition is held during the celebration, and Anaya's son Ignacio Anaya Jr. served as a judge until his death in 2010.